Can integrity be an economic principle? 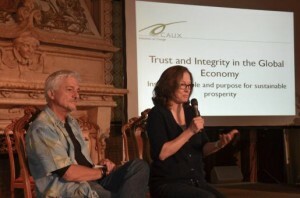 What roles do integrity and trust in the economy play in our daily lives? This was the question discussed at the morning of the plenary session of the Trust and Integrity in the Global Economy (TIGE) conference at Caux, Switzerland. Emma Ihre, Special Advisor, Sustainable Business, for the Swedish Ministry of Finance, tackled more concrete questions and explained how the Swedish Department of Finance ensures that state-owned corporations become sustainable. She referred to the fact that it is important to recruit directors who have ethical values and a corresponding attitude. We must dare to have high expectations and focus on transparency and cooperation. Lisa and Charly Kleissner, founders of the KL Felicitas Foundation, adopted a more individual point of view. How can we, as individuals, be doers of justice in the economy? Charly Kleissner stressed that integrity is to act according to our life goal and our values. Our life is the expression of what we are; we therefore have a responsibility to commit ourselves to what we believe. They also encouraged people to ask fund managers what they are doing with our money. Nobody writes to them to know what they do, it is therefore our responsibility to do so. Lisa Kleissner had a profound personal story that she told the audience. ‘I’ve never had a reflection point or a “ah ha” moment in my life but I’ve always realised that my consciousness is very present in me’. Following a Hawaiian ancestors myth of consciousness and doing good, Lisa knew she wanted to impact the world. ‘We have a simple choice in life – to listen and tap into our consciousness or not’. From growing up in rural Hawaii, Lisa understood scarce resources from an early age. This led her to working on the nexus of the built environment and the natural environment later on in life, before moving onto Silicon Valley. She doesn’t see prestige when she looks at her money, she sees responsibility and stewardship. ‘The question was how to do the right thing with this stewardship’, she saw her and her husband Charly’s money as a chance for change. The couple had the fortunate chance to put capital and resources together and Lisa never once thought about anything other than how to use this capital but for the good. ‘Intentions are beautiful, they are not specific, they set the base for plans’. Lisa let the audience know that the couple, like everyone, had made some bad choices in life. ‘It’s so easy to be defeated by day to day reality’. ‘We are incredibly persistent with our work but not blindly. In 2009 I was diagnosed with a brain tumour, I went into shock. My husband said to me don’t worry, we’ll figure this out and we did’. Despite the risk, Lisa found a doctor that carried out the operation successfully. When recovering she asked her doctor what would happen if she was a woman in India, the doctor replied ‘the tumour would not have got diagnosed, they wouldn’t have the opportunity to have the operation and their chances of survival would be minimal …. actually this is similar for poor women in America’. Lisa reflected on this and her luck for a year, ‘it took connecting to my consciousness, my lucky recovery and believing that we were going to find a path for our skills’. After returning to Silicon Valley, the determined and passionate couple set up Impact Investors. ‘One step at a time has been our path for a long time’. She concluded to the TIGE audience with inspiration ‘it’s up to us in this room and each individual across the globe to raise the integrity of our world, to raise it out of this current failing and unequal global economy’.